Welcome to our Drummond Island Fishing page. We offer fishing boat rentals, pontoon boat rentals and kayak rentals for your Upper Peninsula fishing vacation. The waters surrounding Drummond Island offer some of the most fantastic Upper Peninsula fishing opportunities in the mid-west. Springtime brings a lot of excitement for smelting. This season is often called "smelt dipping" and often groups use small hand held nets to dip out these delicious small fish for their dinner table. Late April, anglers prepare for to catch perch throughout the area. Perch our fun for all ages to fish. When our waters reach 50 degrees, the perch head for the shallow bays and rivers. 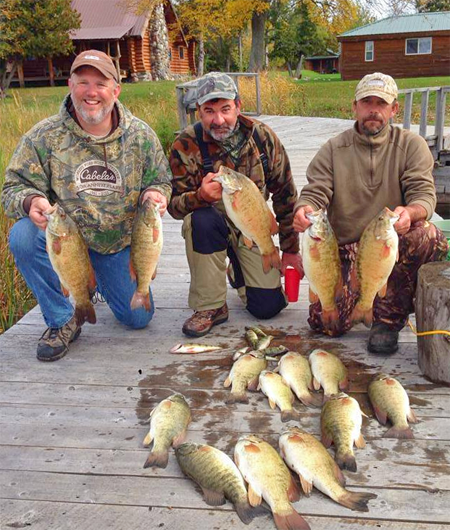 This is your opportunity for Upper Peninsula fishing adventures throughout the region. Smallmouth Bass season begins May 15 and runs through March 15. There is a limit of 5 per day. One of our most popular sport fishes, this species prefers coold clear water with rock or gravel bottoms. Walleyes migrate to the shallower waters during the spring to feed off of other smaller fish. Walleyes are very sought after because they can grow up to 30" in length and they are one of the best tasting fish around! June and July anglers cast their poles for herring, whitefish and cisco. These are schooling type fish. Whitefish can range from 6 to 7 lbs...while herring are usually up to 2 lbs. Walleyes often move to the deeper waters during the warmer summer months. The current state record for a Northern Pike is 39 pounds. There is a limit of 2 per day and they must be at least 24 inches long. Best months for catching pike are May, Jun, Sept, and Oct. Best fishing has been reported early morning and late in the day. Salmon season runs throughout the year. We have Chinook salmon, Coho salmon and Pink salmon. All types are excellent eating and our local Chinook can be as large as 30 pounds! These salmon fight hard and give the angler a great fishing opportunity like none other! Come and stay at our premiere Drummond Island Fishing resort known as Papin's Resort. We have everything you need to bring your fishing adventure to life! Visit our Facebook Page for great fishing photos! Michigan DNR Fishing License (E-License) - Your easy online access!